C.Gars Ltd offer an engraving service on all humidors. 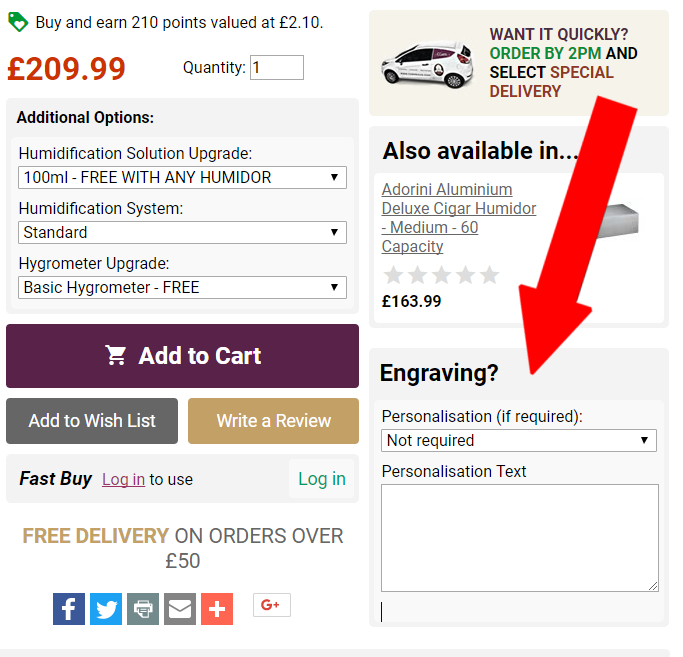 If you require engraving you will need to enter the initials or words that you would like to be engraved in the comments section when going through the checkout. Please note that the humidors are not directly engraved on the wood finish! A brass (or chrome plate) of suitable size based on your engraving requirement is engraved and posted separately. The plate is provided with a clear double sided tape for you to attach the engraving in your preferred place either on the outside or inside of the humidor. Please email us at sales@cgarsltd.co.uk if you require further assistance. To enter the engraving that you would like, please click on the engraving tab on the product page as per the below diagram. We cannot accept returns for personalized items, but we will issue a replacement if we made an error on engraving or other personalization.